Procrustes, one of the sons of Poseidon (the God of the Sea), owned an inn on a road called the “Sacred Way” which ran from Athens to Eleusis – A 14 mile journey. 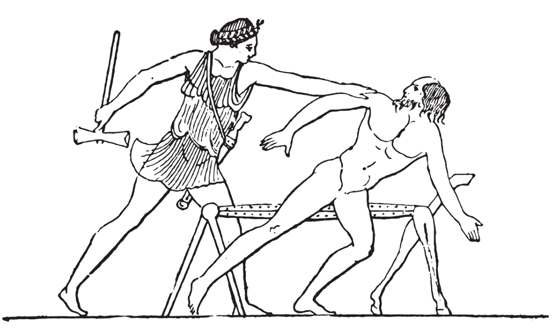 Procrustes was also a renowned metal worker. He was known for creating a bed of iron that would fit anyone who lay upon it. Trouble was, the bed didn’t work quite the way it seems like it would, and he only showed it to a select few. Any travelers along the “Sacred Way” would be offered a warm meal and a good night’s sleep at Procrustes’ Inn. After a rustic dinner and some type of probably horrible entertainment, Procrustes would show the weary traveler their bed, the Procrustean bed. The only thing is, the bed didn’t resize to fit the traveler, the traveler resized to fit the bed. Imagine Procrustes showing the bed to a traveller, letting them lie on it, and then with the strength of a son of a God, held them down and locked them to the bed. That’s when Procrustes would look at the legs of the traveller. Were they too short for the bed, or too long? Too short? Then some stretching was in order. Too Long? Better get the saw! Meanwhile, over in Athens, Theseus – the King and Founder of Athens caught wind of travellers disappearing when they stayed at Procrustes’ inn. Theseus, considered himself a hero and a great adventurer. So when he heard about Procrustes, he had to go investigate. Disguised as a traveller, Theseus arrived, weary from the road at Procrustes’ Inn. As you can imagine, Theseus was given a warm-ish meal, probably some kind of porridge, and was entertained by Procrustes as he played the lyre, the lute, or some other instrument. All setting the stage for the third act – full of intrigue, suspense and murder: the bed. Procrustes shows our hero Theseus the bed. One moment he’s friendly and all smiles, the next he’s attacking. That’s when Theseus jumps into action, removes the cloak that was disguising him, pulls his trusty sword, smiles for the camera and shackles Procrustes to his own bed. I forget whether Procrustes was too tall or too short, but Procrustes doesn’t make it. Our hero Theseus returns to Athens, on a white horse, triumphant, and is showered with affection and confetti by his adoring fans. The tale of Procrustes is a great metaphor for several lessons which apply extremely well to marketing, business and life. One-Size-Fits-All solutions, also known as Procrustean Solutions, are a bad idea. Don’t make your reality, data, subject or problems, fit your ideas, theories, beliefs or solutions. What exists is, can be measured and customized solutions can be developed. I get calls all the time from business people who want to grow their businesses, increase their sales, and make more money for their family. What they should say, but I never hear, is: “Hi Mike, I need to meet with you because I want you to help me grow my business, and increase my sales, so I can make more money for my family. That line of logic is … well … entirely human. It’s the default thought process of most. It’s the brain. It is designed to find solutions to problems. The problem is, it can only use what it knows, what it hears to be true, or what it believes to be true to form solutions from. And most of the time, it comes up with solutions to problems that never solve the actual problem. How many people pick a diet, and stick to it for a week, two weeks, or more? Of those who lose weight, how many keep it off? If the diet was the solution to the problem (being overweight) why are they still overweight? Why didn’t their life change? How many people quit smoking, or doing drugs, or cheating on their spouse, or biting their fingernails, or procrastinating? If the patch, or rehab, or therapy, or hypnosis, or seminars and training was the solution to the problem … why do they still have the problem? Have you heard of chunking up or down? They are NLP terms. They mean going up towards levels of abstraction or down towards specificity. Think of the classification charts which represent the Plant and Animal Kingdoms. From Mammals, you can chunk down to Humans and chunk up to Chordates and even farther up to the animal kingdom as a whole. Well, when you chunk up from “people formulating solutions to their problems which aren’t actually solutions” you get “problems.” and when you chunk down, you get “unresolved issues” which create the desire or need to find a solution to the problem again. It’s a kind of a trap! What’s really odd about this, since one of my heroes is Milton Friedman, is this trap is a major driving force in capitalism. But they don’t know better. They routinely buy stuff that doesn’t solve their problems. Think about that. That is a HUGE marketing lesson! As a capitalist, I don’t think we should protect people from themselves however. That’s what socialists do. But I do think that Business Owners and Marketers need to perform due diligence to understand what their problem actually is, and identify several solutions to it. From there, they can create a plan of action that has the best chance to actually solve the problem. The 2% of people who don’t get upset by that type of questioning and hang up on me, become my clients. And because they are willing to fully identify their problem first, the solutions that we come up with not only solve their problems, they are extremely profitable as well. Some people have questioned if the campaigns we have developed are procrustean solutions themselves, since they follow the same patterns regardless of industry. Marketing is Strategy + Tactics. If you only look at tactics, you miss the bigger picture. Besides, each business is unique. Well, let me say, each business should be unique. At least in some respect. Finding and promoting that uniqueness is what marketing is really all about. When someone names the solution to their problem, like SEO. They are identifying the tactic they think is required to solve the problem. But, finding the actual solution to the problem requires research and strategy. 24 Hour Emergency Service, Broken Pipes, Water Heaters, Same Day Service, Serving this County, Call Now! Marketing like that just wastes money. There’s nothing separating the competitors from each other. They commoditize themselves and the only way the customer can choose is price. Think about it. Put both of their ads in the same place, like Google AdWords, or in the Yellow Pages. How will a customer choose between the two? They both look the same. If one isn’t cheaper in price, it’s a flip of the coin. Maybe your ad is first on the page, or the customer likes green and your ad is green so they choose you. If you want to prevent this from happening to you so you can control the growth of your business, you need to understand the actual problem, and you need a strategy. Only by understanding the problem, identifying the potential solutions and preparing a plan of action will you be able to achieve your goals. But, if you still want to spin the wheel, or roll the dice because you don’t have time or money to “do it right,” then by all means, go pick an inexpensive off the shelf solution without understanding the ways your needs change that solution, or are implemented within that solution. However, you would be wise to remember the tale of Procrustes. Don’t try to fit into a solution unless you know how the solution fixes the problem.